STEVONIA and GLADONIA pictures (click on the ship name to see its picture). Both ships were built in the 1930s and, according to the Captains under which I served, were scuttled during WWII in harbors, including Rotterdam in one case, by British crews during the Nazi takeover, finding harbor exits blocked by the invaders, and, according to marine custom, sunk to avoid them being used by the enemy. Both were refloated after the war, refitted with Dutch engines and marine systems, and returned to service under Ellerman and Wilson, one of Britain’s largest cargo shipowners. Both were therefor prewar designs, with chain steering and old-fashioned “shipboard telegraph” engine control systems, though they had elemental radar and voice radio, with an 8 man inflatable lifeboat. 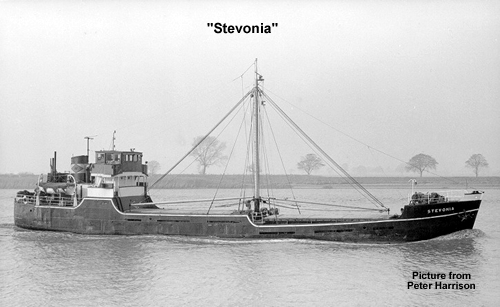 They were “coasters” 400 net ton bulk cargo capacity, capable of travel on rivers and canals, generally operating in the Channel, North Sea and Baltic Sea–known at the time as a “Soviet Lake”, with a colorful mixture of East/West shipping, both surface and undersea. A major submarine pen existed on Island Rugen, territory of the “German Democratic Republic”–you can imagine their nationality. The shipping line I worked for acted as a marine version of the CIA’s “Air America”, but of course for the British equivalent. Being the newest crew member, I spent many shifts in my wool felt marine hooded coat next to the anchor winch at the prow of the ship trying to make out ships or other obstacles we might hit during dense fog. I had a bell to ring if I saw something–but of course you can’t stop a ship quickly (no brakes! ), so I would have been history had we made contact. Radar is great, but it is only useful a half mile ahead. One near sinking and a narrowly avoided oil fire rounded out the excitement. Otherwise it was fun, especially during turns at the wheel (of course I had an officer telling me where to go).